Happy Sunday Everyone! Holiday season is right around the corner...are you freaking out yet? I hate to admit that I am already worrying about getting everything down before family Christmas gatherings and other holiday activities. I made a to-do list & then promptly kind of freaked out. ugh. But, I have good news. For the next 12 days, I'll be sharing some fun & easy holiday ideas that you can do with just a few ingredients, or a handful of supplies. Sounds like a winner, right? First up, is one of my favorites of all the goodies I'll be showing you. 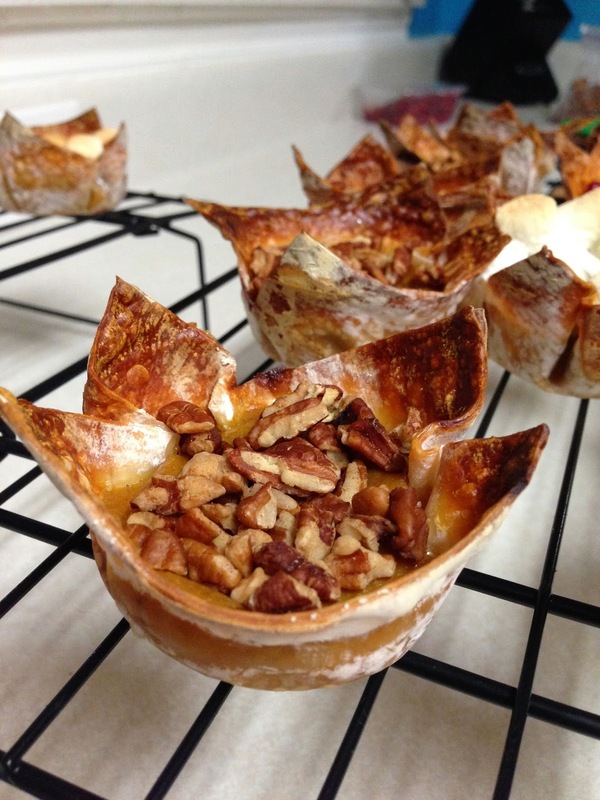 Wonton pumpkin pie bites. Oh yes. I know that pumpkin pie is already a pretty easy go-to dessert for winter gatherings, but these adorable pint-sized treats are so good. And you don't have to mess with a pie crust! I also love the crunchiness of the wontons and they were so delicious after a night in the fridge I had not one, but two for breakfast. Yum. Preheat oven to 415 degrees. 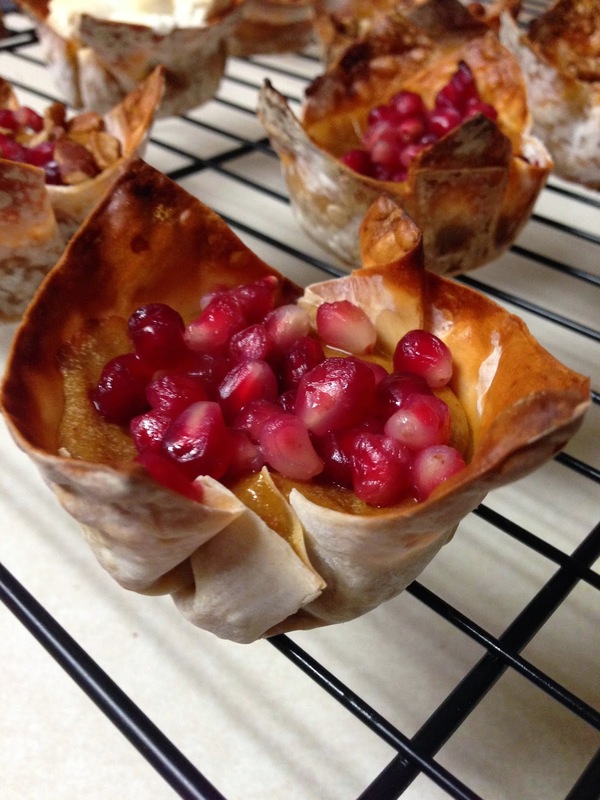 Arrange wonton wrappers in two regular sized muffin tins, folding edges as you go, so that there is a nice big open area for the pumpkin pie. The edges will stick up, that's ok. In a large bowl, mix can of pumpkin with spices. Slowly whisk in sweetened condensed milk until combined, then whisk in eggs. Carefully fill each wonton 'shell' 2/3 of the way full. I used an ice cream scoop & it made it a little easier. Brush the exposed pieces of wonton with your egg wash.
Cook pie bites at 415 degrees for 10 minutes. Turn the oven down to 350 degrees, and cook for 15 - 20 more minutes until pie filling is done. In the last 5 - 7 minutes of cooking, top pie bites with toppings if desired. Our favorites were pomegranate seeds, chopped pecans and marshmallows. If using marshmallows, place those bites on the top rack to help toast the mallows. Let pie bites cool completely on cooling rack. Store in refrigerator. Eat within two days.